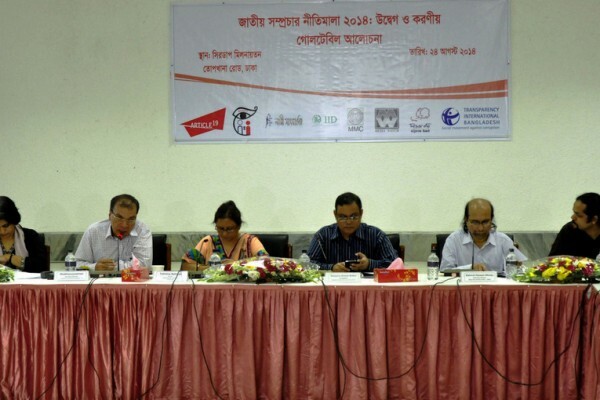 The ghost of highly discredited and ambiguous Article 57 of the ICT Act 2006 is reappearing in the new Digital Security Act, argued IID’s CEO Syeed Ahamed at a discussion held in Dhaka. He was speaking at a roundtable titled “Legal Review: Proposed Digital Security Bill and Citizens’ Rights”, organized by the Committee for the Protection of Fundamental Rights that held on 1st October 2016. He stated in the context of rapid changes in technology, there are many good reasons to put in place a law to ensure cyber security and to prevent abuse of privacy and online threats to security and individual reputation. We also need to be aware that digital communications have played a huge role in pushing forward our development and growth. So, we need the law to maintain a balance between twin objectives, of ensuring cyber security on the one hand, and enabling digital communication for development, democracy and growth on the other. However, some controversial sections of the proposed bill are threatening the prospects of evidence-based development. Ambiguous Section 15 is a concern here. Even to implement Banganbandhu’s dreams, the works and policies of Bangabandhu may go through research and often, constructive criticism. Similarly, despite our emotion on liberation war history, we will have to engage in global academic debates with evidence and arguments. When Sarmila Bose wrote a history which many of us disagreed with, we could write critically and comment on her piece and argue with her and win those arguments. If we only use law to highlight our history, instead of logical arguments, we will fail to highlight our glorious history in global discourse. Arguing against section 15(4), he questioned, if a foreign policy goes against our fundamental principles, why should we not speak out against it? When some Americans opposed their state policy to support our liberation war in 1971, we agreed they were right to do so. Then why should we have a double standard in play? More importantly, the law asks not to write anything that go against Bangladesh’s foreign policy, whereas Bangladesh do not have any foreign policy except for few lines in the Constitution. The ghost of Section 57 of the ICT can be seen in sections 19 and 20 of this law. From that experience we can ask: what action will be taken against those who bring false allegations and harass a person or subject them to confinement? Since offences under this law are compoundable but non-bailable is there a real risk of corruption and intimidation to compel people to plead guilty? Will the broad limits put on online speech on grounds of ‘hurt to religious sentiment’ seriously curtail freedom of expression particularly on social media? Among others, Barrister Sara Hossain and eminent jurist Shahdeen Malik attended the event.